Barnsley remain the standout side in raw shot terms, firing in almost twice as many shots as their opponents this season. Leaders Luton have also been dominant and strangely a few of the division’s strugglers in Shrewsbury, Oxford and Bristol Rovers have also created more chances than they’ve faced. Peterborough‘s promotion challenge always looked a bit suspect to me given that they’ve occupied the undesirable top left quadrant for most of the season. Sunderland have created relatively few chances this season but have been ruthless in front of goal, with Peterborough also powering a promotion push this way. 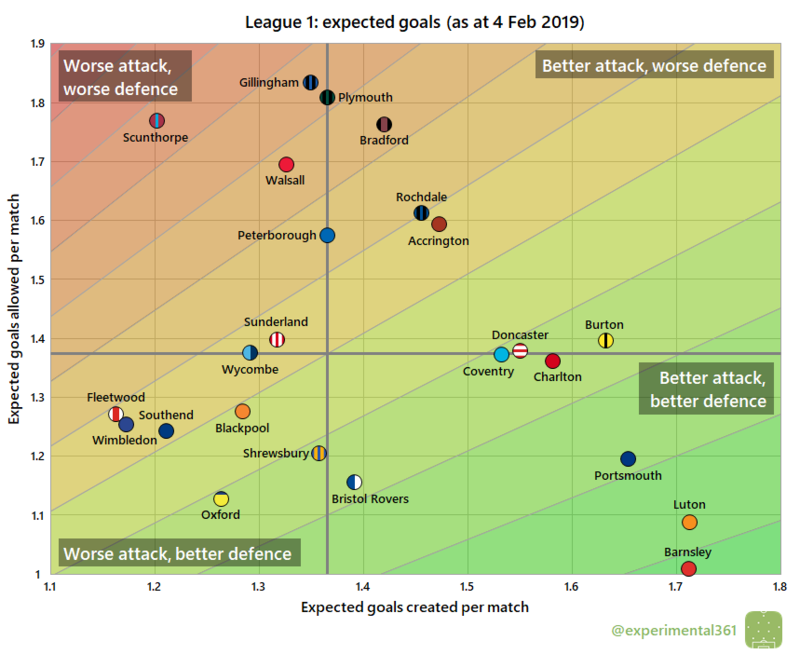 It’s been a dismal season in front of goal for Bristol Rovers and Accrington, who have struggled to find the net despite getting shots off pretty frequently, and Wimbledon who have struggled for both quantity and quality. 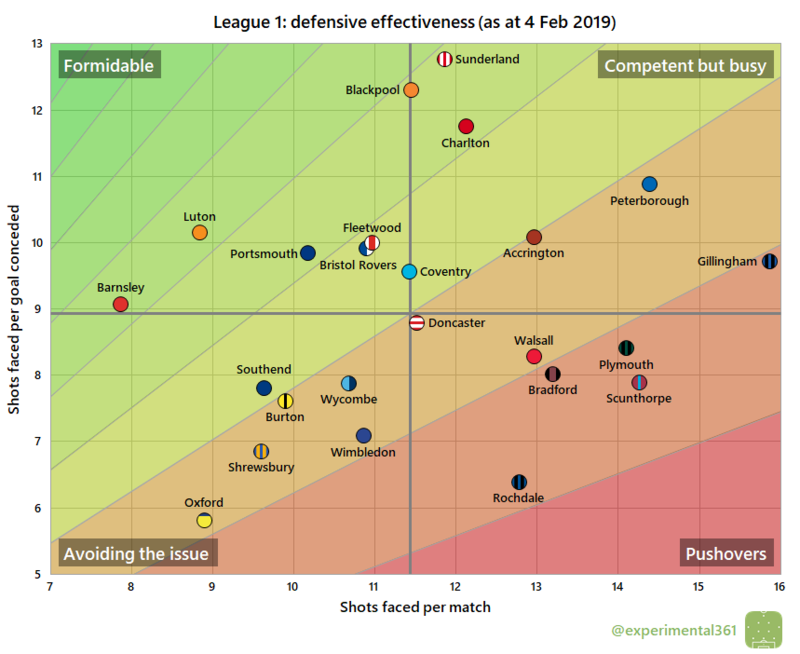 Not only do they have the sharpest attack, but Sunderland have operated the most resilient defence this season, while Blackpool and Charlton have also built promotion challenges on top of a stubborn back line. Despite only two sides allowing fewer shots at their goal than Oxford, Karl Robinson’s side have found it incredibly difficult to keep opponents from scoring. 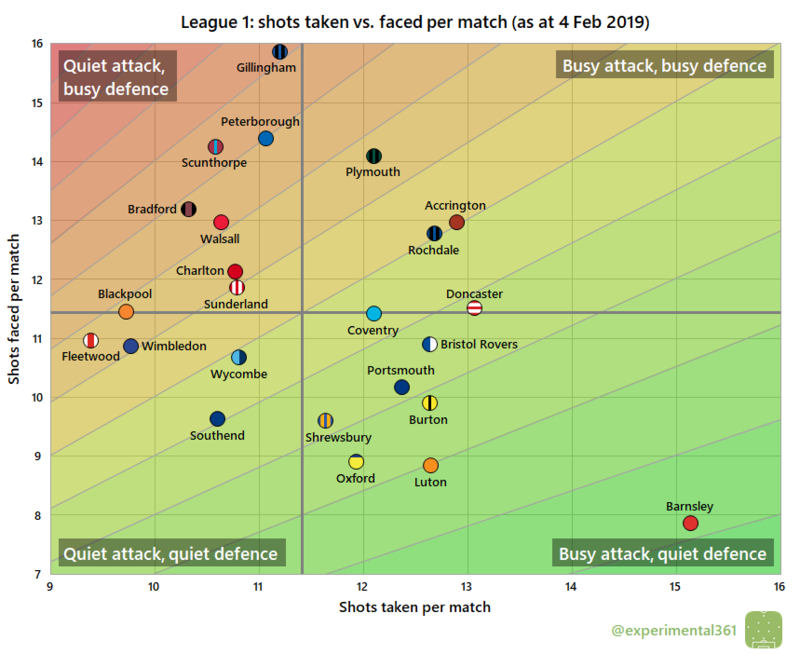 When we adjust for shot quality – as well as I can measure it – Barnsley, Luton and Portsmouth sit a lot closer together as the three leading sides in the division. 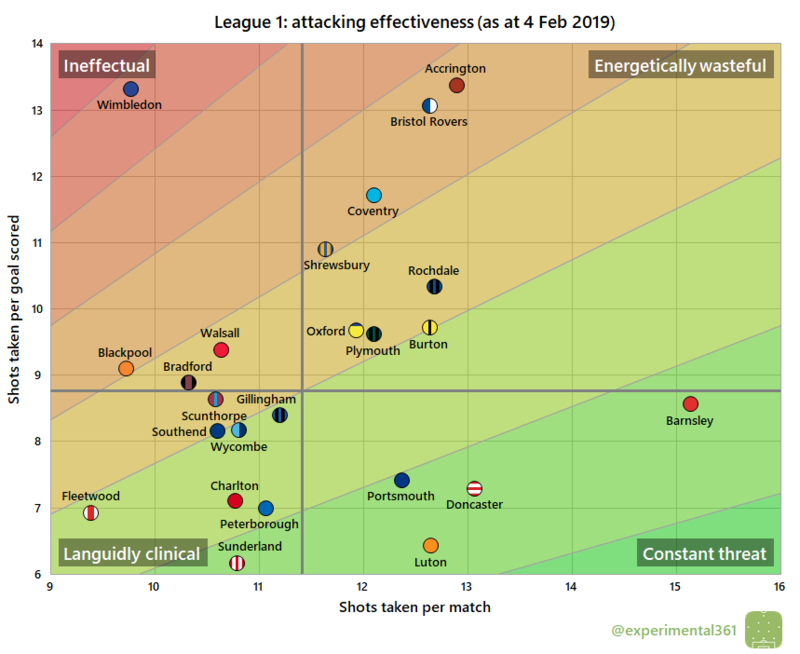 The struggling trio of Bristol Rovers, Oxford and Shrewsbury look better defensively than up front but it’s still a bit odd that they aren’t all doing better, so perhaps all three can avoid the drop this season. Scunthorpe‘s performances are the most worrying overall, so if nothing changes then they may get dragged back towards the bottom four.